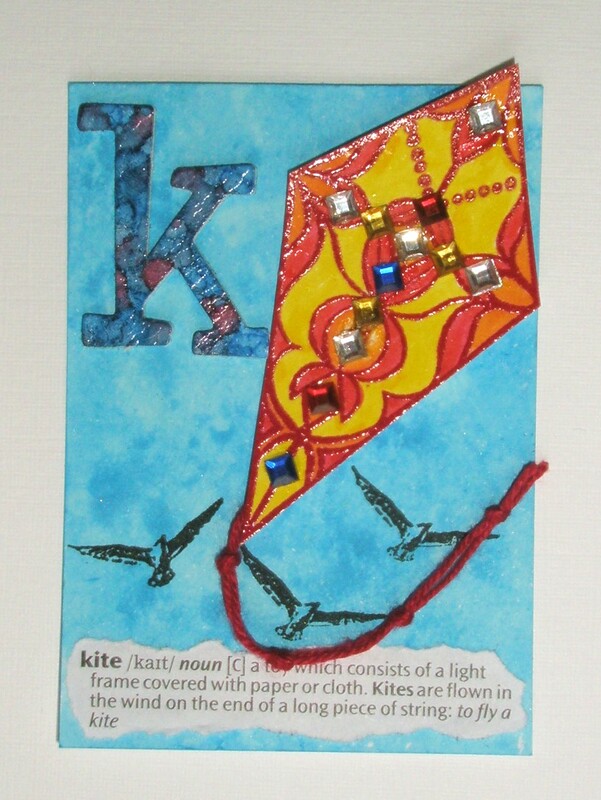 Here's my next ATC for The Craft Barn Alpha/Dictionary Challenge where the letter is K for KITE mainly but a few others too!! The background is a mix of Salty Ocean and Broken China Distress Inks, spritzed with water and wiped up with the ATC. The KITE is the Decorative Diamond stamp from Oak House Studio, embossed with red embossing powder and brightly coloured with Tombow pens. I've added some tiny gems for a kaleidoscopic effect and attached some knotted string for the tail. It's just finished with the dictionary definition, the alcohol inked vinyl thicker and some seagulls (Crafty Individuals CI-278) - they're flying in the sky with the kite and the feathers are made of Keratin!! Hope you like and thanks for looking. I'm off to see what everyone else has been up to - not many K words but I'm sure lots of you have been kreative!! Ah, what a beauty of a kite! Adding birds to this flight was a great idea! Great ATC again Elain love your colourful Kite! The kite looks fantastic and so colourful. Its a great ATC. Fab! Thank you for detailing how you made your ATC. I love seeing which words people have chosen & how they illustrate them. Let's go fly a kite!! So much fun and glorious colors!! Great! Another kite - I thought I would be the only one! Love the colours and all the details! What a lovely splach of colour. I like the Knowledgable explanation! What a fun ATC.Great composition and colours and I love the gems. Your kite is fabulous, what a great word choice. Wonderful ATC, great background colour and use of the diamond stamp for the kite. The sky is beautiful and a lovely contrast to that lovely kite. The bird stamps add so much perspective to the high flying kite. Love the bling on the kite. You have certainly managed to find a number of K's for your dictionary page. A krafty endeavour . Hugs Mrs a.